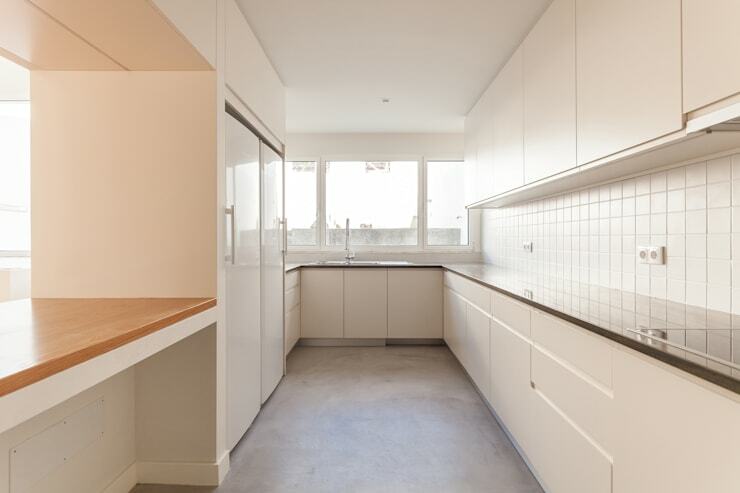 Here on homify we have pretty much seen it all – at least, that is what we thought until we stumbled upon this little gem. Seeing as we ourselves had to do a double take to ensure our eyes weren’t deceiving us, you might also be equally surprised at what a juxtaposition the exterior façade and interior create together, or how confusing the dialogue between the spaces is, but you won't be able to deny that, somehow, it works. 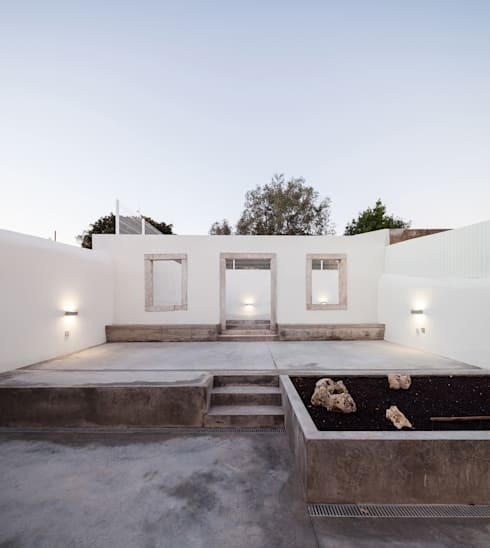 Taking a traditional frontage, the architects in charge of this project maintained a quiet respect for the original building, but transformed it beyond belief once crossing the threshold to the interiors. 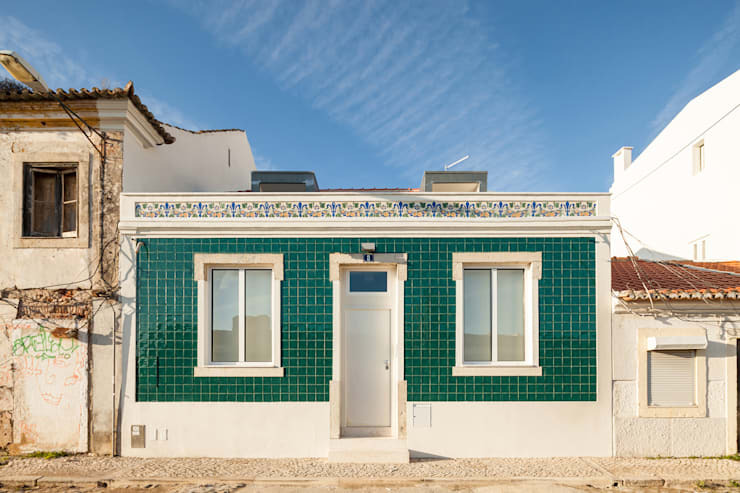 Nobody can deny the huge visual appeal that those tiled surfaces add to the front façade of this cosy little house. And speaking of little, that is about the only thing you notice about this house apart from its detailed façade – its small size. Which begs the questions: how can there by an impressive surprise inside? Well, how about that? Not only is this home a wide open, beautiful space, it is also MUCH bigger than we anticipated it to be. With an almost exclusively glass rear wall, the home is drenched in natural light and feels warm, wonderful and inviting. This living room is filled with so much illumination and life, thanks to the white and wood combination. Of course, any home with such a bright and modern interior will have natural, easy and fluid transitions between spaces, so it comes as no surprise to us that this living room naturally blends into a sweet-looking kitchen as well. Simple carved doorways, with no actual doors, maintain the open feel and maximise how huge the property feels. 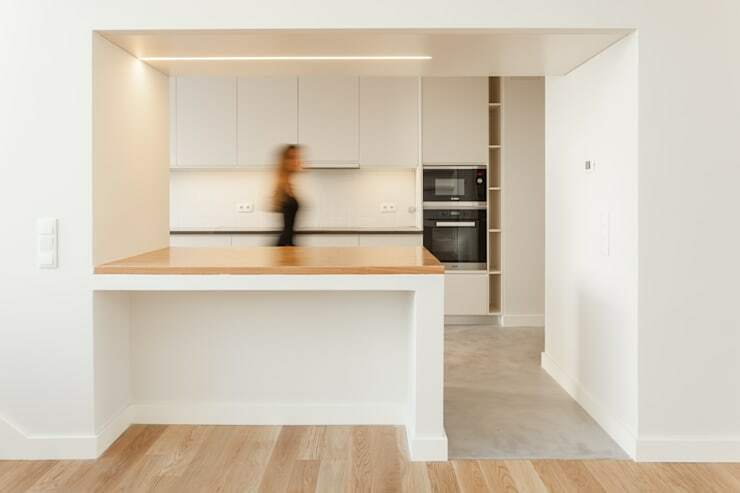 We just couldn’t skip over the kitchen, especially not when we could see how this space and the living room blend into one another, with the only main difference between the two (apart from function) being the different floor finishes. Polished concrete makes perfect sense for the kitchen and adds an industrial vibe into this home. The straightforward design of this culinary space is what makes it so special. Other designers may have been tempted to keep the space open-plan with the rest of the living room, although we must admit that we quite adore the way it’s been boxed in without looking cramped, creating a cosy and comfortable little cooking haven. 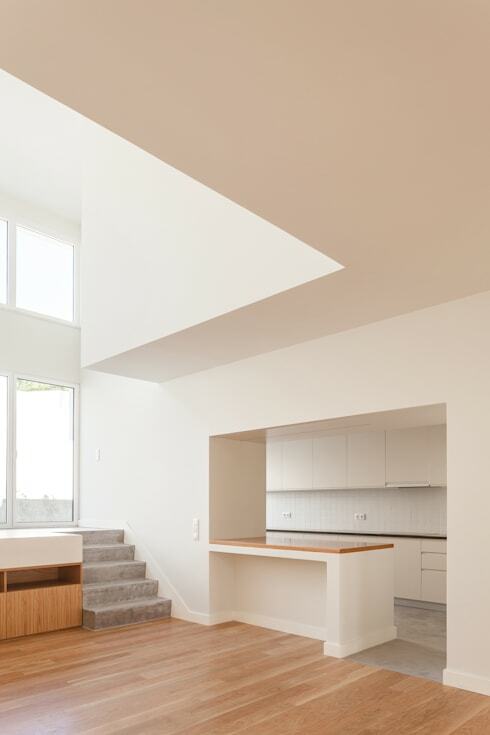 Of course the fact that the entire space is drenched in natural light also makes a big difference. 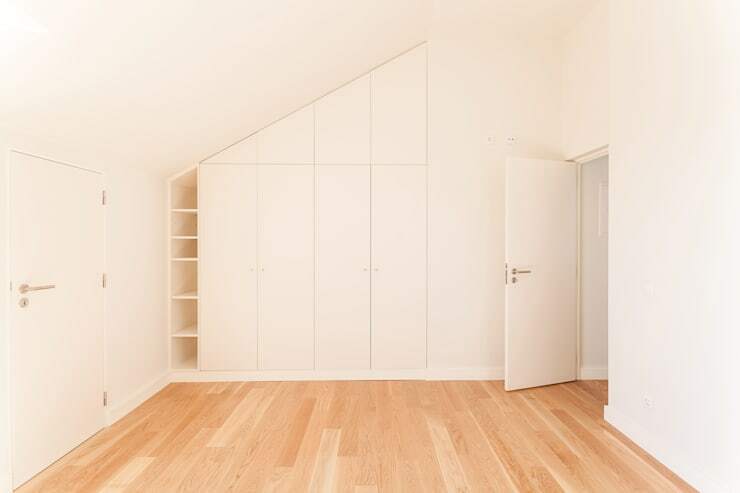 Of course this house is filled with numerous little touches of genius that help to set it apart from less impressive homes—like the way built-in furniture has been used everywhere to maximise storage potential and minimise jarring additions to rooms. Seeing as the communal and sleeping zones all flaunt a look of brightness and warmth, it is up to the bathroom to be a little different—and we’d be lying if we were to state that we didn’t love this fresh vibe going on in here. 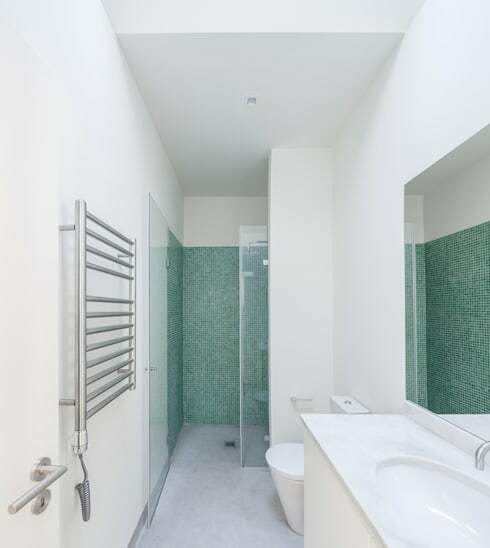 Bright white and crisp green make for a fabulously clean and dazzling bathroom, which feels well equipped and very contemporary. As we gaze out into the back garden of this home, we catch a glimpse of another slice of history in the form of this original wall. What a delight to find that the architects decided to keep it, as it offers such character and grounds even the new parts of this house into the surroundings more naturally. 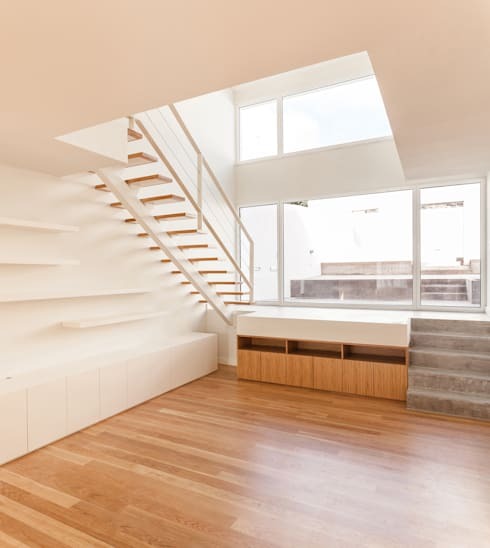 Looking at the rear of this house, it's amazing how simple it looks, but you can't deny that the simplicity brings with it a really striking dynamic as well. 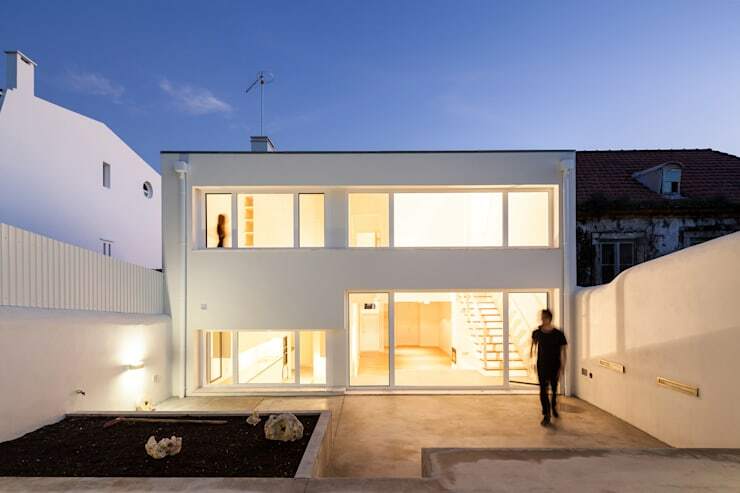 Even though the glass looks wonderful, it's the smooth white walls, which contrast with the patterned front façade, that really tie everything together. A most definite style surprise in our books! Fancy something more… technological? Then have a look at The modern high-tech house.